Since having two babies to take care of, I’m loving meals that are good tasting, fresh ingredients, easy to cook and clean up. Once I saw this chicken parm skillet meal I knew I had to make it. I have to admit at first I was super intimated to cook on my cast iron skillet, but we are becoming better friends. The key is to cook low and slow on it. You could use any skillet for this meal, you don’t need to have a cast iron skillet. This recipe made a ton, so we had leftovers for a few days and it was just as good! Using a food processor, grind the tomatoes until they are ground. Heat your skillet pan for a few minutes, then add the oil, garlic, oregano, red paper flakes and a few shakes of the salt shaker. Cook until fragrant, about one minute. Stir in the tomatoes , water, 1 cup of the broth and the pasta. Bring to a boil, then lower to a simmer and cook for about 20 minutes or until pasta is soft. Stir in 3/4 cup of the parmesan, a shake of the pepper, and the chicken. Stir in the remaining 1/2 cup of broth. 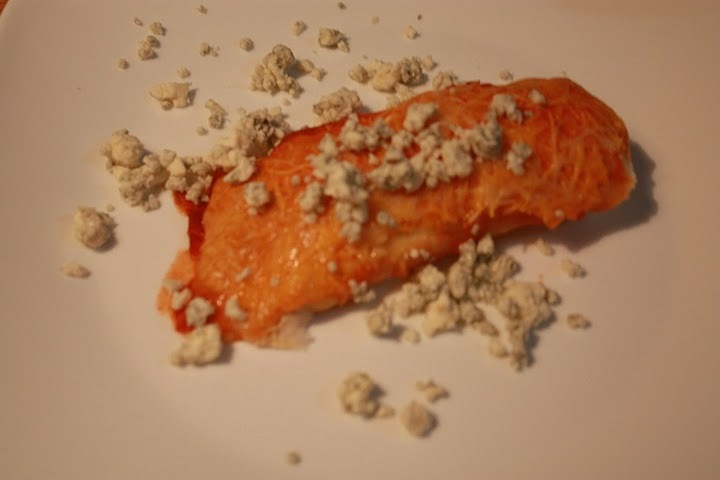 Transfer to a baking dish, or if using a cast iron skillet, you can put this right into the oven, sprinkle with the remaining cheeses, bake 5 to 10 minutes, or until the cheese is melted and bubbly! 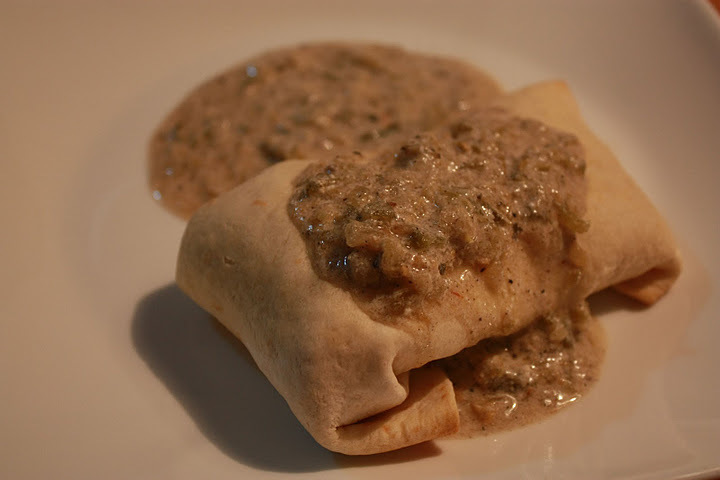 Chicken Chimichangas are one of my favorite’s that I order from our local Mexican restaurant. 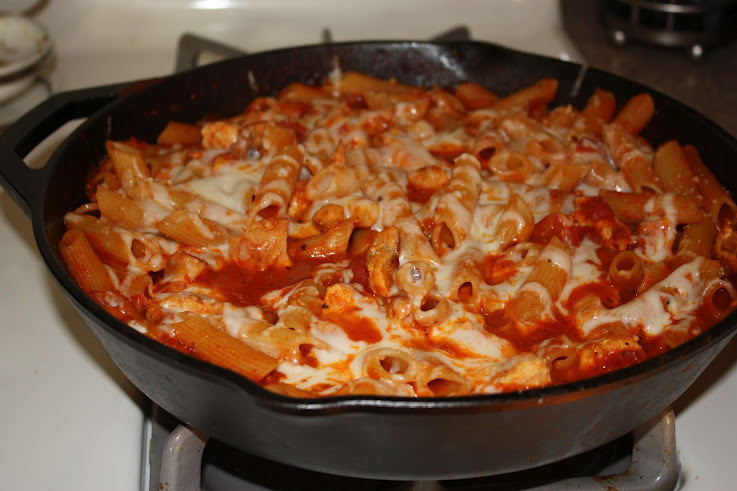 They are so flavorful and I love the mixture of cheese and chicken. I came across a recipe, which I heavily adapted to fit my food allergy, and also the recipe I found was more a crock pot meal, I made it into non crock pot meal. It was a much lighter version of what you would get in a traditional mexican restaurant. It was pretty good! Bring a medium saucepan to a boil, place in chicken breast and boil for about 10 minutes. Once done and cooked through, shred the chicken. Add the cumin, onion powder, garlic, and the chiles to the shredded chicken. Mix well. Add the cheese, mixing well again. Fill each tortilla with the chicken mixture, roll the tortilla up, tucking in the ends, and place seam side down, repeat for next three tortillas. Spray the tops and sides of the filled tortillas with cooking spray. Bake for 20 minutes. In a small saucepan, combine the salsa verde and sour cream. Mix well and cook over medium heat until warmed. Serve the chimichanges with the salsa verde mixture over top. We love to make our own pizza’ for football Sundays at our house! We usually do the typical pepperoni and cheese. This time we were driving home from visiting my parents and Chris asked what we wanted to do for dinner. He mentioned pizza. I said let’s do something different with the pizza, at first he was “like what” and I suggested a BBQ Chicken pizza at first I could tell he wasn’t a fan, but then he thought for a split second about and we ended up having a discussion over what BBQ sauce we would use. See, my husband is super picky about his BBQ sauce, he will only use one Vidalia Onion that comes from this tiny little farm stand in South Jersey. Me, on the other hand, I don’t care for store brand, I like speciality ones but am much more open to different types. So we decided to do half and half, half of his and half of mine. 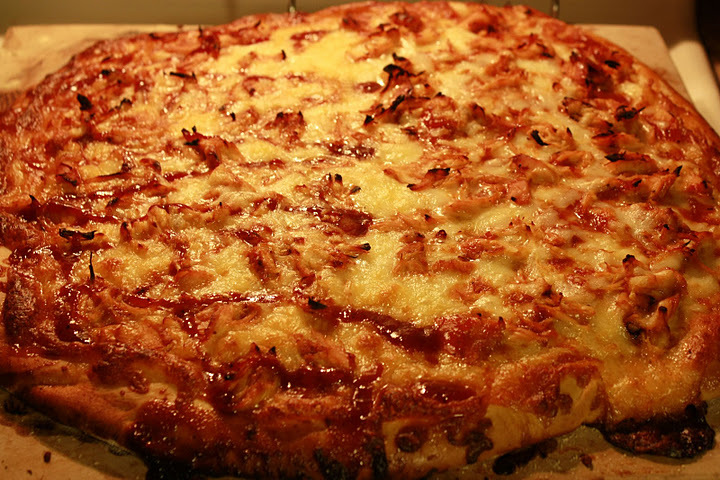 To be completely honest with you, this was the best pizza we ever made. It wasn’t greasy at all, the crust was perfect! I would do this again and again and again! Speaking of the crust, you can use any pizza dough recipe that you may already like or buy a pre-made one. Personally we use Pillsbury Hot Roll Mix for our dough/crust. It’s super easy to make and takes about 5 minutes to rise. Prepare pizza dough according to directions. Sprinkle some olive oil over the dough. Paint some BBQ sauce over the edges of the dough which will be your crust. Add cheese to dough and then top with BBQ chicken. Squeeze extra BBQ sauce over top of the pizza, as much flavor as you would like it to have. We found a few swirls was enough. Bake in the oven according to your pizza dough directions and the amount of time it also tells you do cook it for. Let it cool for about 5 minutes after removing from the oven. Slice! In a crock pot, add chicken, salsa verde, salsa, cumin, onion powder, garlic powder, 1/2 cup of water and salt & pepper. Cook on low for 6-8 hours. After chicken is done cooking, use a fork to shred it, place back in crock pot and keep it on warm. Before serving, chop lettuce and tomatoes. 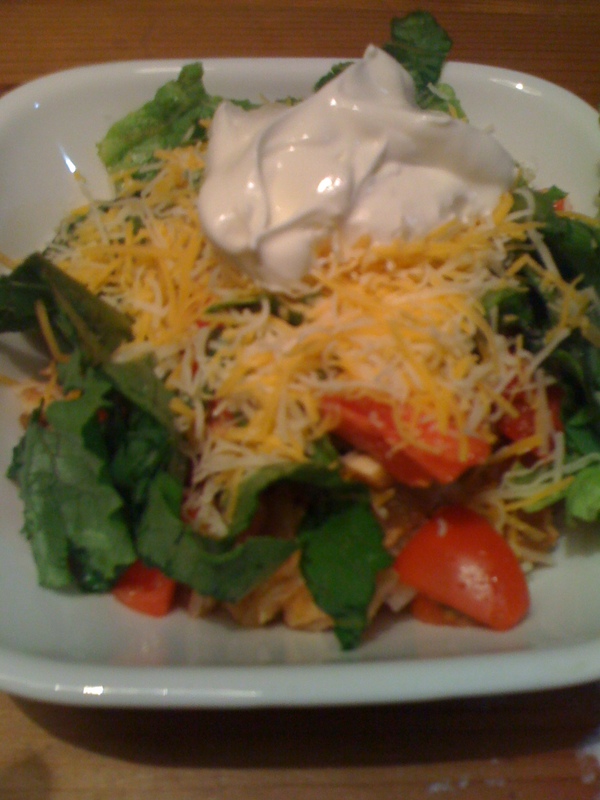 Place rice on the bottom of the bowl, add chicken, lettuce, tomatoes, cheese and sour cream to bowls. Mmmm, pumpkin, one of the best things about fall. This is another great recipe, that’s pretty easy to make. I threw it together right before starting dinner last night and it turned out awesome. The husband must have approved because he had a piece last night and a piece for breakfast! It’s that good! Preheat oven to 350 degrees. Grease a bread loaf pan. Combine pumpkin, 1 cup of sugar, brown sugar, 3 egg whites, milk and oil in a bowl till well combined. Then add flour, spices, salt, stir till combined. In a separate bowl, combine cream cheese, remaining sugar and last egg white until combined. 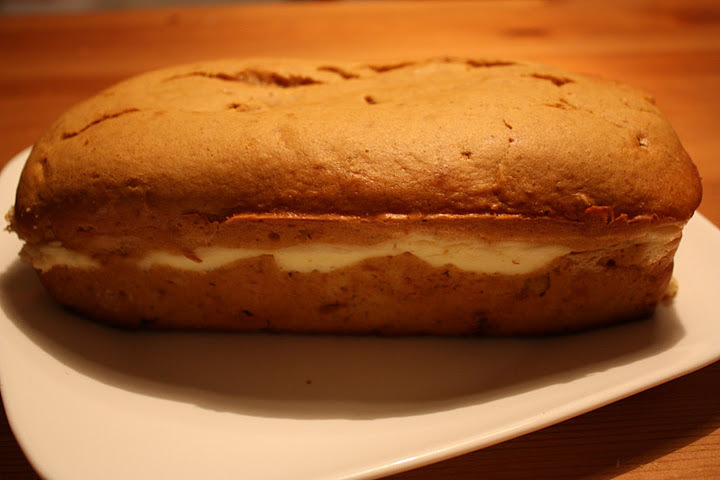 Pour half of the pumpkin batter into the loaf pan, then top with cream cheese mixture, then top with remaining pumpkin mixture. Bake for one hour or until toothpick comes out clean. Let bread cool in loaf pan and then remove. Store in the refrigerator because of the cream cheese. Think about a baked potato, with cheddar cheese, and bacon all melted in together and scooping out a big bite of that potato. Now think of ALL of that together in a soup on a rainy cold day. Amazing! 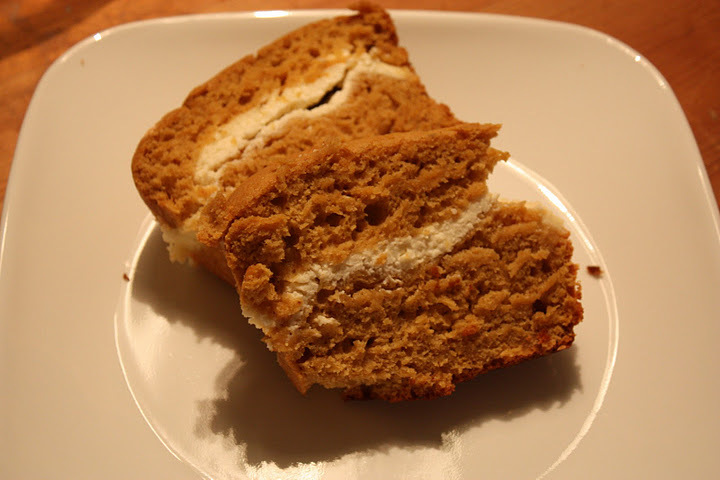 This was a great recipe, I will be making it again. This recipe was so easy to throw together before heading out for our class at The Little Gym, so it would be easy for anyone who is working or not even working. Not many ingredients either which makes it easier also. Combine everything in crock pot, except for cream cheese. Cook on low for 6-8 hours. About an hour and a half before you are ready to serve, cut cream cheese into small blocks and place in crock pot and cook until melted. You will have to stir this quite often so it melts. I actually turned my crock pot up to high for this process. 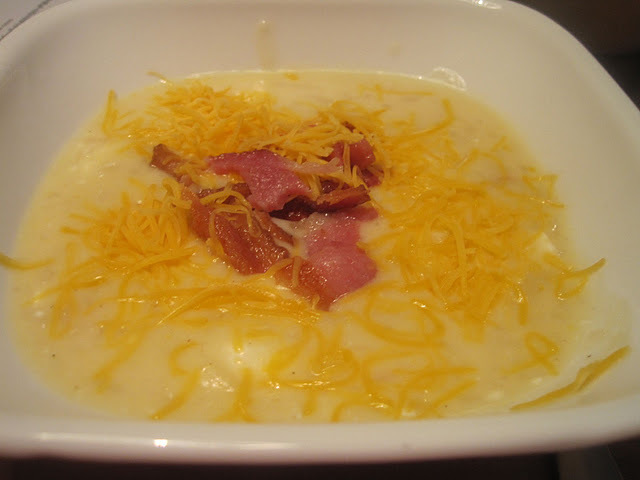 Serve soup in bowls and garnish with bacon and cheddar cheese. Recipe adapted from Erin’s Eats. My husband is from Buffalo, born, raised and bred, so when I see anything “Buffalo” in any recipe title, I usually make it no matter what it is. When I think of enchiladas though, I never thought about using a buffalo wing sauce instead of the traditional chicken mixture/sauce. I was super interested to try this and when I told my husband what I was making for dinner he automatically said “Yum.” See, it doesn’t matter what it is, but if has Buffalo in the recipe he is all about it with no further questions. Typically he ask a few questions, like what is in the recipe, how do you make it, etc. Let me tell you, this recipe didn’t disappoint at all. It was amazing! So juicy, flavorful, just yummy! Boil chicken thighs for about 10 minutes, till they are cooked through. Drain water, place in food processor and just pulsate for a second or two, so you have shredded pieces and not mush. Spray a 9×13 baking dish with non stick cooking spray. Pre-heat oven to 375. In a separate bowl, mix together hot sauce an enchilada sauce. Add the shredded chicken and 1/2 cup of cheese in another bowl, mix until it’s incorporated well. Pour in about 1/2 cup of the sauce mixture. Pour a small amount of the sauce mixture into the bottom of the baking dish. Take each tortilla fill it up with a few tablespoons of the chicken mixture, roll it up in the baking dish, making sure seam side is down. Once you have all the tortillas filled, drizzle the rest of the sauce mixture on top of them and sprinkle some of the leftover cheese on top. Bake for 20-25 minutes.